Pretty much everyone wants healthy, youthful, and wrinkle-free skin, but what are you willing to try to achieve that youthful glow? One of the trendiest words in skincare right now is collagen because the human body’s collagen production decreases with age. You’ll likely find collagen creams, powders, and pills in the beauty aisle of your favorite store, but it’s important to understand where collagen skincare products come from and if they are really effective. The body naturally uses collagen to maintain and strengthen the skin, bones, and joints. It is an amino acid protein that occurs naturally and enhances the elasticity of skin. However, the body begins producing less of it in our 20s and 30s, causing skin to lose its plumpness and result in wrinkles. Collage is also used for wound healing, vascular prosthetics, and even for joint issues for people with osteoarthritis. Collagen skincare products can be very expensive, so it’s best to understand what you’re getting into before opening up your wallet. Many collagen products are made from animal extracts or marine sources. The animal byproducts often used in these products are cow hide, fish scales, and chicken feet, which may be troubling to vegans, vegetarians, and animal lovers. If you are going to use a collagen skincare product, choose one with the fewest and simplest ingredients, avoid products with unnecessary additives, and ask your doctor for advice if you’re unsure about the product. Collagen skincare products promise a lot, but there is not a lot of evidence to prove that they actually restore smooth and youthful skin. Studies have shown that once the body’s natural collagen stores are gone, there isn’t much that collagen supplements can do to help. Furthermore, the animal byproducts used to make collagen supplements are not strongly regulated for safety or efficacy. However, collagen is still a good moisturizer for the skin even if the collagen molecules in lotions and creams are too large to penetrate the outer layer of skin. 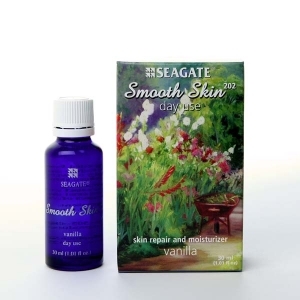 To take a natural approach to healthy skin, we recommend Seagate Smooth Skin, a therapeutic skin ointment that’s rich in Omega 3 fatty acids and is blended with extra virgin olive oil, coconut oil, natural vitamin E, and vanilla oil. This remedy is loaded with natural antioxidants and antimicrobials to promote healing without the need for any harmful chemicals or questionable manufacturing methods. Since boosting your body’s collagen stores with supplemental collagen may not work the way you hope it to, the best ways to protect the collagen you still have is to avoid cigarette smoke, wear sunscreen daily, and eat a diet rich in protein and antioxidants.